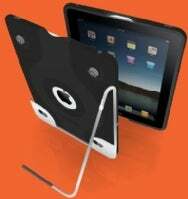 After teasing its extensible iPad case last June, ModulR on Wednesday announced that its system is now available. If you’re just tuning in, at the core of the ModuIR system is an iPad case with four low-profile mounts on the back designed to integrate with a number of ModulR accessories—such as desktop stands, wall mounts, carrying straps, and car setups. ModulR is now shipping its core case, the accompanying cover, the Slim Mount for the wall, and Quick Stand for propping the iPad up for typing or showing off media. Arriving at an indefinite “soon,” however, are the Universal Swing Arm and Shoulder Strap. To celebrate the occasion, ModulR is offering a package discount on its three available components. Individually, the Case + Cover, Slim Mount, and Quick Stand sell for $60, $30, and $20, respectively, or $110 total. For a limited time, you can get all three for $100.